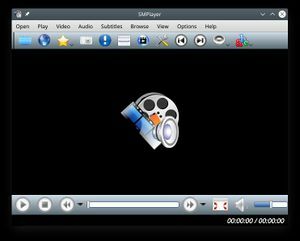 SMPlayer intends to be a complete front-end for MPlayer, from basic features like playing videos, DVDs, and VCDs to more advanced features like support for MPlayer filters and more. 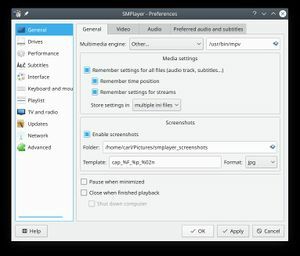 SMPlayer player isn't a KDE application, but provide some good integration with KDE. Configurable subtitles. You can choose font and size, and even colors for the subtitles. Audio track switching. You can choose the audio track you want to listen. Works with avi and mkv. And of course with DVDs. Seeking by mouse wheel. You can use your mouse wheel to go forward or backward in the video. Video equalizer, allows you to adjust the brightness, contrast, hue, saturation and gamma of the video image. Multiple speed playback. You can play at 2X, 4X... and even in slow motion. Filters. Several filters are available: deinterlace, postprocessing, denoise... and even a karaoke filter (voice removal). Advanced options, such as selecting a demuxer or video & audio codecs. Playlist. Allows you to enqueue several files to be played one after each other. Autorepeat and shuffle supported too. Preferences dialog. You can easily configure every option of SMPlayer by using a nice preferences dialog. Possibility to search automatically for subtitles in opensubtitles.org. It's multiplatform. Binaries available for Windows and Linux. 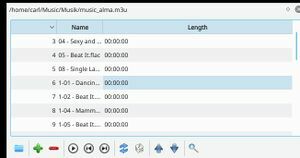 If not included in your distribution, you can download SMPlayer from it's website in Windows binary or Linux source code format and in packages made for some specific distributions. This page was last modified on 26 December 2018, at 15:46. Content is available under Creative Commons License SA 4.0 unless otherwise noted.